Cruising along Highway 1 during the annual Pebble Beach Tour d'Elegance. 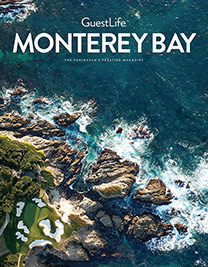 A long racing tradition and prestigious car competitions have made the Monterey Peninsula a surprising epicenter for the world’s automotive elite. 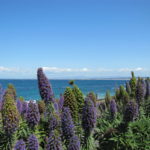 For 10 days every August, the Monterey Peninsula becomes the center of the automotive universe. The peninsula certainly isn’t a manufacturing hub, like Detroit; Stuttgart, Germany; or Maranello, Italy, the home of Ferrari. But for anyone fascinated with historic automobiles and automotive design as high art, nothing compares to Monterey Car Week. This engaging series of events showcases hot cars and haute fashion, where the millinery is sometimes a match for the machinery — a collection of dream vehicles ranging from the lavish luxury coaches of royalty to the sports cars that made racing history. With multimillion-dollar auctions offering the world’s rarest vehicles and vintage Detroit muscle cars, as well as gatherings dedicated to German marques and for Ferrari-lovers, every automotive taste and epoch gets spotlighted here. More than 200 rare vehicles are on display at the event and car competition — from a voluptuously curved 1937 Cadillac Series 90 Hartmann Cabriolet to sleek, 1960s-era Indianapolis 500 racers. Judges meticulously scrutinize the vehicles, grouped in an assortment of classes, for the authenticity and completeness of their restorations, as well as overall style and elegance. Even on a foggy Pebble Beach morning, the cars, their bodies, grills, and hood ornaments polished to a high sheen, positively shimmer. Winners from separate categories vie for honors as Best in Show, the classic-car world’s ultimate accolade. In past years the award has gone to everything from vintage speedsters to streamlined coupes as graceful as an art deco sculpture. 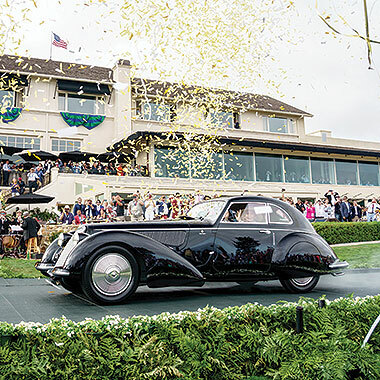 But for all the splendor of the other 2018 finalists, it was hard to dispute the Best of Show selection: a black 1937 Alfa Romeo 8C 2900 B Touring Berlinetta owned by David and Ginny Sydorick of Beverly Hills. 2018 Best in Show 1937 Alfa Romeo 8C 2900 B Touring Berlinetta. Photo courtesy Kimball Studios/Pebble Beach Concours d'Elegance. Although many of the cars are of museum quality, they’re not mere museum displays. Instead, these automotive masterpieces are van Goghs on the go. During car week’s Pebble Beach Tour D’Elegance, owners take their vehicles for a loop around the peninsula, including on the famed 17-Mile Drive and south on Highway 1 into Big Sur. Almost 200 cars, among them such rarities as a Ferrari 250 Lusso and Shelby 427 Cobra, also cruise down to Carmel-by-the-Sea for the Concours on the Avenue, an exceptional (and free) opportunity to get up-close looks at a diverse selection of classics. To characterize the cars that come to Monterey as priceless is only a slight exaggeration. Sales during car week’s six automobile auctions in 2018 totaled an astounding $370.9 million. A Ferrari 250 GTO SI Coupe at the RM Sotheby’s event set a record as the most expensive car ever sold at auction when it fetched a cool $48.4 million. The 250 GTO provides a unique link to the birth of Monterey’s car culture. Its original driver was Phil Hill, who, 11 years before becoming the first American to win the Formula 1 championship, triumphed in the inaugural Pebble Beach Road Races, a 1950 event held in conjunction with the debut of the Pebble Beach Concours d’Elegance. Hill would go on to win three more times at Pebble Beach during a bygone era of Monterey motorsports. In those years, Jaguar and Alfa-Romeo sports cars raced among the pine trees of the Del Monte Forest, cornering around sharp turns with nothing more than snow fencing and stacks of hay bales for barriers. The pines came down to the roadside and, silhouetted against the bright sky, created a distracting effect that some drivers likened to looking into a strobe light. WeatherTech Raceway Laguna Seca, formerly known as Laguna Seca Raceway, was dubbed "North America's most iconic racetrack" in 2009 by Motor Trend. Photo courtesy WeatherTeck Raceway Laguna Seca. 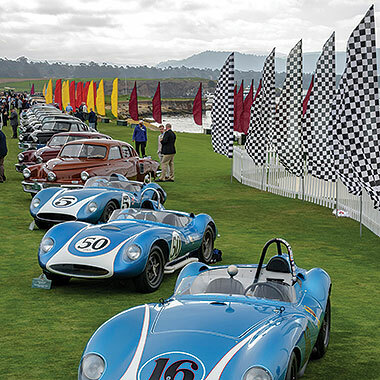 Raw and dangerous, Pebble Beach emerged as the birthplace of American car racing for sport. But crashes were common, and the tragic death of driver Ernie McAfee in 1957 ended this period of Monterey Peninsula racing, leading to the opening of Laguna Seca Raceway. Lauded in 2009 by Motor Trend as “North America’s most iconic racetrack,” it’s now known as WeatherTech Raceway Laguna Seca. 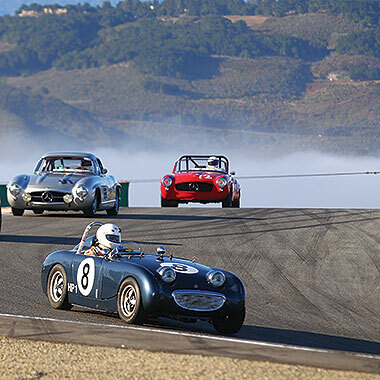 The 2.238-mile circuit set in the rolling hills between Salinas and Monterey is most renowned for The Corkscrew, a brief serpentine stretch that combines tight curves with a steep drop of 109 feet in only 450 feet of track distance. Over its six decades, the course has challenged many of the most fabled names in racing. Jackie Stewart made his American racing debut at Laguna Seca, and the likes of Mario Andretti, Bruce McLaren, and Mark Donahue took the checkered flag here. Hill won the Laguna Seca Can-Am in 1967, his final year of racing. But his competitive fire and run of excellence on the Monterey Peninsula didn’t end with retirement. In 1977 his 1927 Packard 343 Murphy Convertible Sedan took honors as Best in Show at the Pebble Beach Concours, the second time one of his vehicles won the coveted award. In many ways, Hill embodied the Monterey Peninsula’s automotive tradition — a heritage of speed, style, and elegance unrivaled anywhere else in the world. Photo courtesy Pebble Beach Concours d'Elegance. Sixteen blocks of downtown Carmel-by-the-Sea showcase more than 175 domestic and foreign collector vehicles. Hundreds of classic sports cars and vintage autos grace Lighthouse Avenue for an afternoon of car-gazing. The breathtaking Carmel Mission becomes the heavenly backdrop for a variety of vintage automobiles. An all-women’s car show that gracefully lines up the streets of Carmel-by-the-Sea. All eyes are on center stage at the Monterey Jet Center, where this VIP event unfolds with the best cuisines, wine, and automobiles. The ultimate fashion show on wheels. Pick up a car guide, but don’t miss the Car Concept Lawn (remarkable cars with revealing designs) and The Ferrari Way.